I accidentally deleted over 20 photos from the SD card of my Fujifilm FinePix digital camera. They are very precious photos taken during our family vacation. Can I recover them without any backup? There were both jpeg and raw images. Fujifilm is one of the finest digital camera brands, but it is sometimes heart-breaking for many people when their captured Fujifilm images are lost due to accidents. If you have never backed up SD card data to computer, then the situation would be severe. Don’t worry if it happens to you. 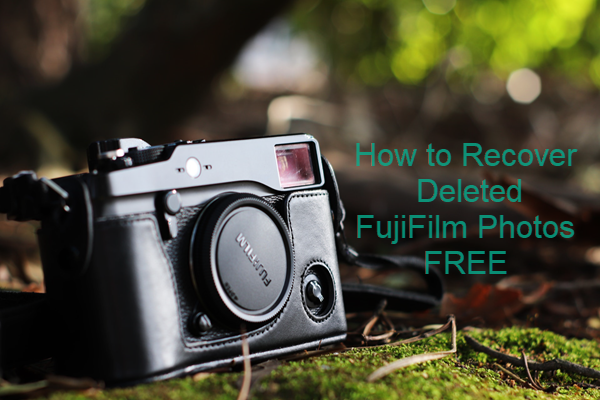 In this tutorial, you will learn how to recover photos from Fujifilm free. How Are Photos Lost from Fujifilm Camera Memory Card? Why Are Lost Fujifilm Photos Still Recoverable? How to Recover Photos from Fujifilm Free? Wrong operation: Accidental deletion, formatting, failed transfer, etc. Memory card error: not formatting, no SD card, virus attack, etc. When a photo is removed from your Fujifilm camera memory card, or other storage device, it is not permanently wiped. The system only marks the space of the removed photo as available for writing. Therefore, until new data overwrite the space of lost photo, it is still possible to recover lost Fujifilm photo. Nevertheless, there are two key factors that determine whether we can restore lost Fujifilm photos without backup or not. The most important thing is that you should stop using the storage device to avoid data overwriting. The second requirement is a free Fujifilm photo recovery software. RePicvid Free Photo Recovery is able to retrieve deleted photos from Fujifilm FinePix series, X-series and more models. 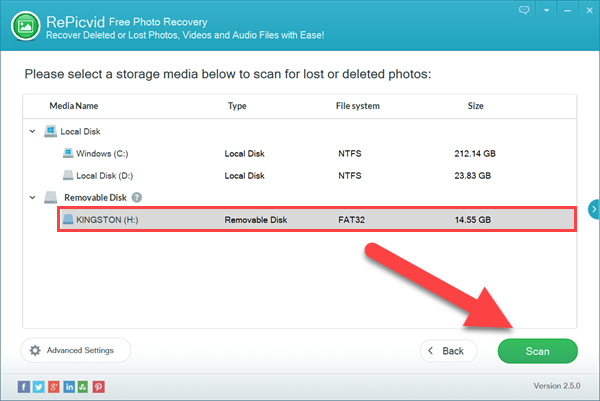 As long as the lost photos are not yet being overwritten, you can use this photo recovery freeware to scan your memory card for undeleting Fujifilm pictures. Compatible with all Fujifilm X-series, FinePix series, GFX series, etc. Support all Fujifilm-recommended SD, SDHC UHS-I/UHS-II, xD Picture cards manufactured by SanDisk, Lexar, Kingston, Samsung, etc. On the main interface of the Fujifilm photo recovery software, you will be asked to choose an option for recovery. 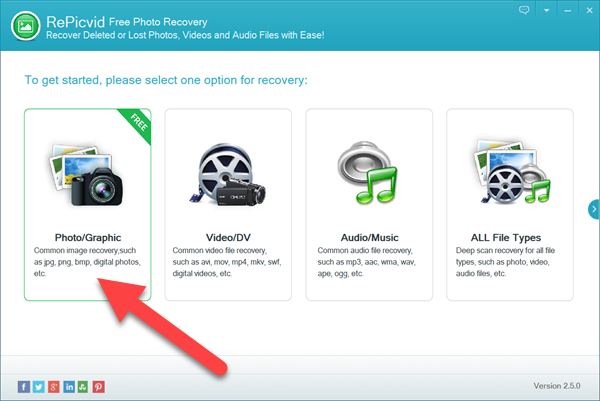 If you just want to recover photos from Fujifilm for free, please click Photo/Graphic. You can also choose other options for audio recovery, video recovery or deep scan for all files. On the second screen, you need to select the storage media where you lost the pictures. If the storage device is a memory card connected to computer, then look for it on the Removable Disk section. Select it, then click Scan button to proceed. Note: You can also click Advanced Settings button on the bottom-left corner to manually choose file formats for scanning. After scanning, the program will show a list of photo formats on the left column, by clicking which you will be able to preview photos in the formats. 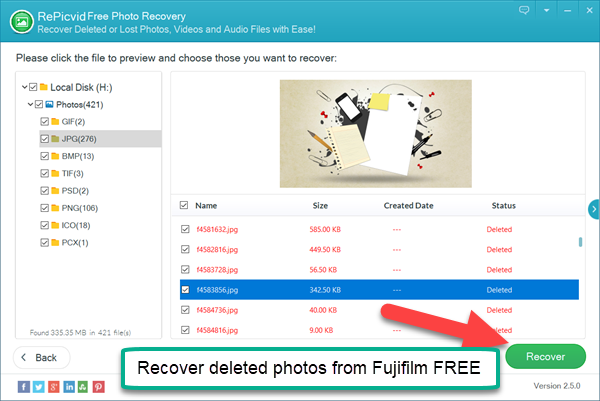 Once you have checked the photos you need, click Recover button to restore Fujifilm photos back. Now your lost Fujifilm photos should have been recovered to your computer. It is suggested save them properly. If you find some of the recovered photos corrupted due to partially overwriting, please check how to repair corrupted images. Feel free to tell us in the comment area if you have any question.